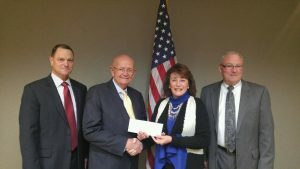 Jan Smith, CEO of S3, presents the donation to GEN (R) Sullivan (second from left). Also pictured are Jim Barclay, President of S3 (far right), and Bob Johnson, Sr. VP of the SETA Services Business Unit (far left). S3 joins the Three Star Circle of Distinction with its financial support to the National Museum of the United States Army. The Company’s contribution to the Army Historical Foundation honors the American Soldier by helping establish the 185,000 square foot National Army Museum to be located on 80 acres at Fort Belvoir, VA.
After nearly 241 years of courageous and selfless service to our country, the Army is the only U.S. military service that does not have a national museum to call its own. The museum will tell the complete history of the US Army; educate the expected 750,000 annual visitors about the myriad roles the Army has played throughout the history of our country; and inspire pride in service for the more than 30 million men and women who have served since 1775. Groundbreaking for the museum occurred in the autumn of 2016. According to GEN (R) Gordon Sullivan, this event has generated significant momentum in three areas: public awareness, fundraising, and site preparation with a goal to open the museum in 2019. S3 encourages other companies and individuals to contribute to this very important campaign which honors so many who have made sacrifices for our way of life – from the birth of the Continental Army in 1775 to the continuing struggle in 2017 against determined foes around the world. More information can be obtained by reviewing their web site at www.armyhistory.org or by contacting Elizabeth Moloney, Director, Major Gifts, at elizabeth.moloney@armyhistory.org.